Fans take cover from the rain. 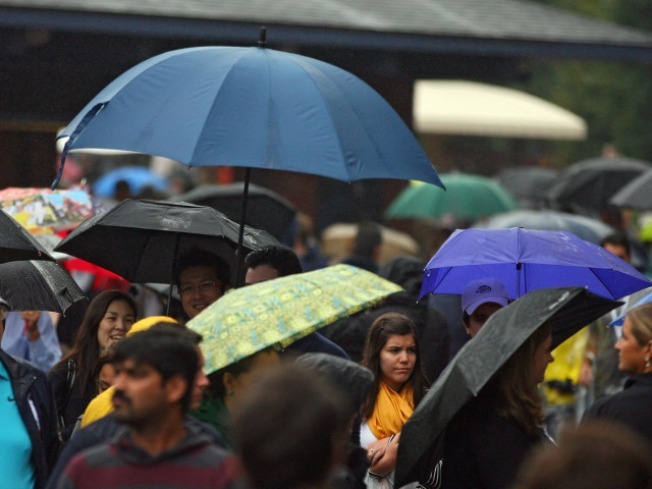 With news of rain heading to San Diego, many events planned for this weekend may be affected. Showers could start overnight on Friday, followed by scattered showers in the early afternoon and heavier, steadier, rain late afternoon on Saturday. The rain should move out overnight with some lingering showers early Sunday. This weekend, three highly anticipated events will be taking place; the 7th Annual San Diego Bay Wine and Food Festival (Nov. 17-21), the Mother Goose Parade (Nov. 21), and the Breast Cancer Walk (Nov. 19-21). The Wine and Food Festival will feature 70 of San Diego’s top chefs and celebrity chefs, including James Beard Award winner Roy Yamaguchi of Roy’s Hawaiian Fusion Cuisine on Saturday, former “Top Chef” star Brian Malarkey, and many more. There will also be continuous food and wine tasting from a selection of over 800 wines, and a $50,000 Chef of the Fest competition. The festival is located on Embarcadero Marina Park in San Diego. The 64th annual Mother Goose Parade present by Cox Communications is the largest parade in San Diego County. It attracts thousands of spectators each year, and is usually held the Sunday before Thanksgiving. The event includes well over 100 parade entries from a variety of cities throughout the U.S. and is admission is free. Also featured at the event are the motorized floats, marching bands, animated clowns, performing artists and celebrities, and Santa Claus. The parade is located on the streets of El Cajon. The Breast Cancer Walk, more formally known as the Susan G. Komen 3-Day for the Cure, is a 60 mile walk to raise awareness and funds for breast cancer. The walk begins on Del Mar fairgrounds, and continues through UCSD Scripps Institute of Oceanography, Taylor Library 4274 Cass Street on Friday, Robb Field South-North, South Mission Blvd. On Saturday, and San Diego Visitor Information on Mission Bay Drive and lastly, Reuben H. Fleet Space Theater on Sunday. There will be a closing ceremony at Petco Park after the walk on Sunday.